Validation of the final 18-gene T cell–inflamed GEP. 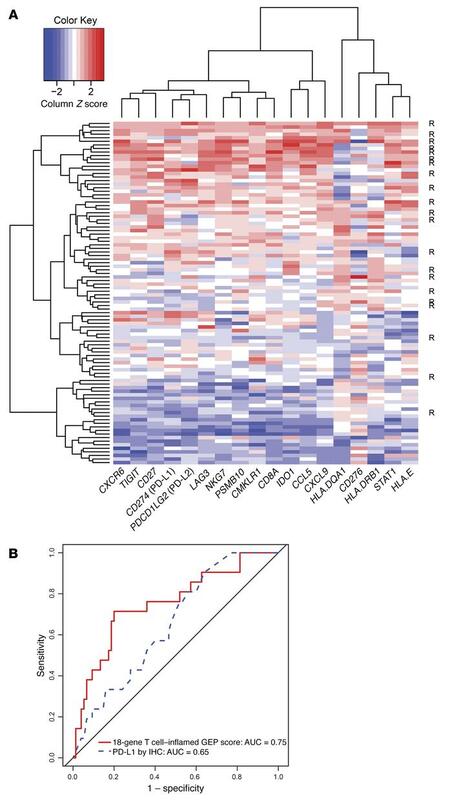 (A) Heatmap of 18-gene T cell–inflamed GEP in 96 PD-L1–unselected patients with HNSCC from KEYNOTE-012. Expression levels have been standardized (centered and scaled) within columns for visualization. The “R” on the right side indicates whether the patient was a responder (by central imaging vendor). The rows and columns have been grouped using unsupervised clustering. (B) ROC curves comparing final 18-gene score with expression of PD-L1 as measured by IHC on tumor and inflammatory cells for a cohort of 96 PD-L1–unselected patients with HNSCC from KEYNOTE-012 considered evaluable for objective response by central imaging vendor.